After homemade pecan waffles, it was time to pack up again. I checked my computer once more and it seems to be working wonderfully. I knew I didn’t have time to head any further west in Tennessee, because I wanted to make sure I had a chance to see some of the Smoky Mountains. 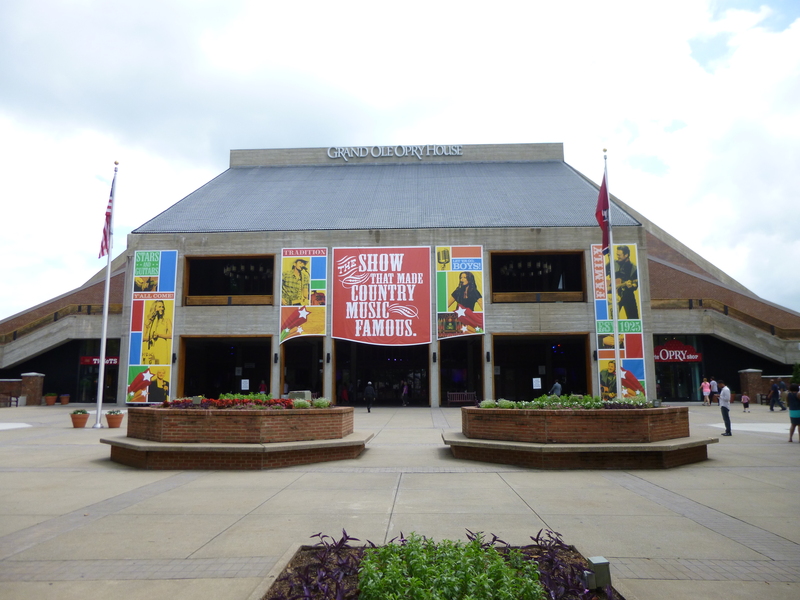 But I couldn’t leave Nashville without seeing the Grand Old Opry House! Despite the fact that it was on the other side of town, Linda was game to drive out there too and walk around a bit more. I followed her out there, and it took quite a while and I began to wonder where exactly we were going, but Nashville is simply a really big city! 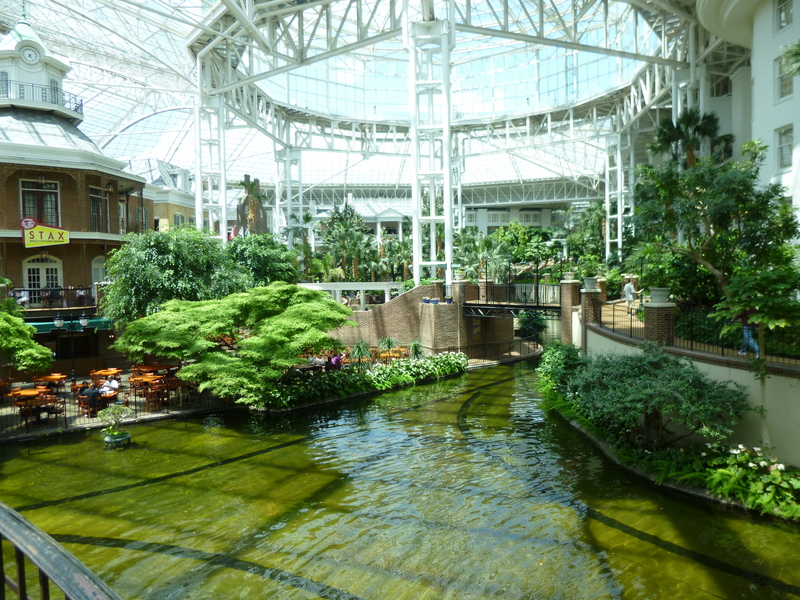 We pulled into the Opryland area and it was very crowded. Gone are my days of easily getting in and out of different places during the off-season. Like everyone else, I’ll now be dealing with crowds and heat! 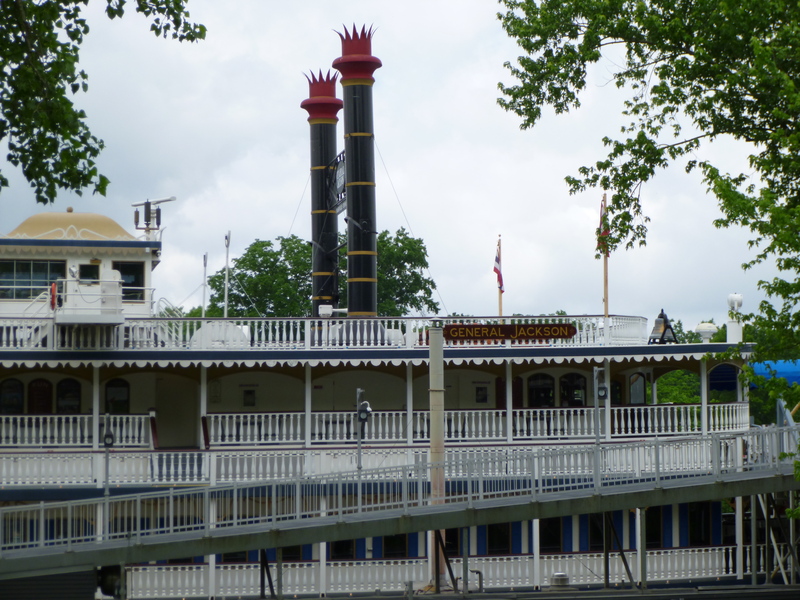 We stopped to take a look at the General Jackson, a big paddlewheel boat that still takes people on excursions up and down the river. They were getting ready for a trip this afternoon. 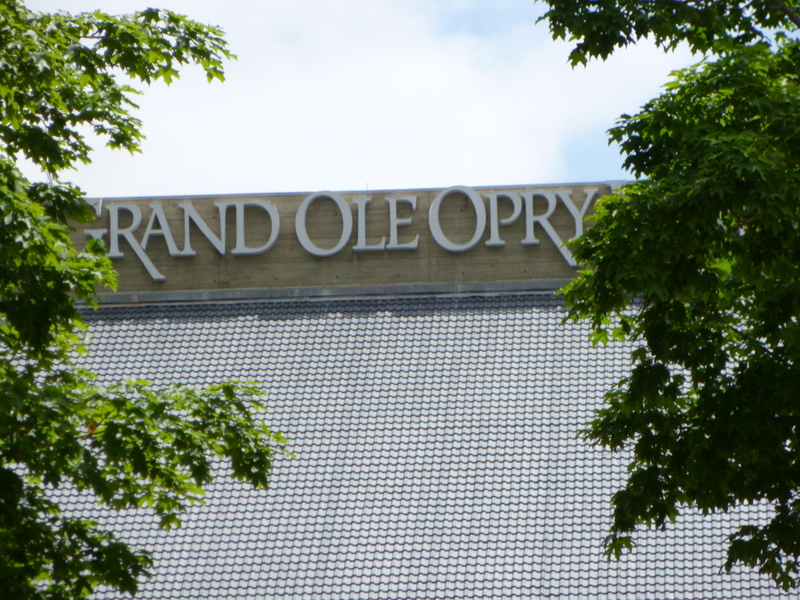 Then we drove over near the Opry House. 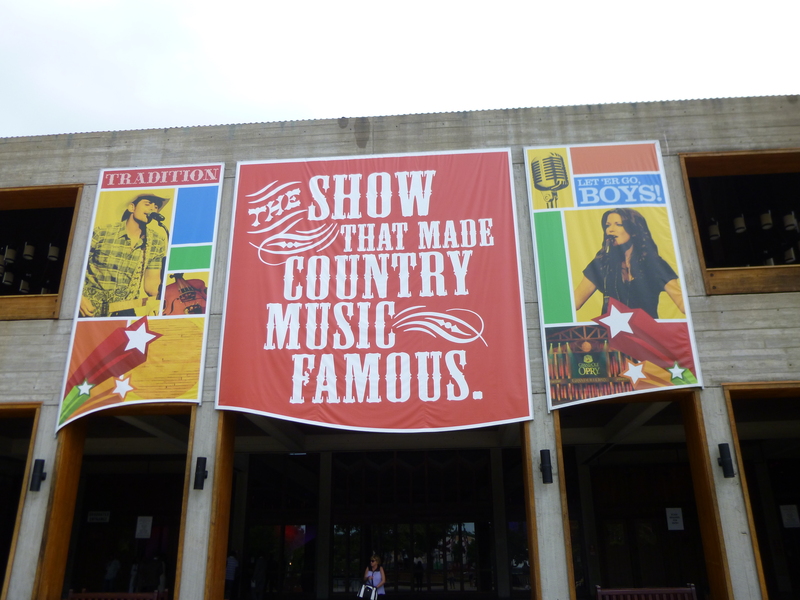 We couldn’t go inside, but we could walk around the grounds, and look at all the country music artists pictured on the front. When Linda’s boys were growing up, there used to be an amusement park here also, but that has been torn down and replaced by the giant Opry Mills Mall. We decided to go walk a lap around the mall, so I left Tula in the car with the a/c, and we went and walked around the whole thing, and then we got a gyros sandwich and some baklava for lunch. 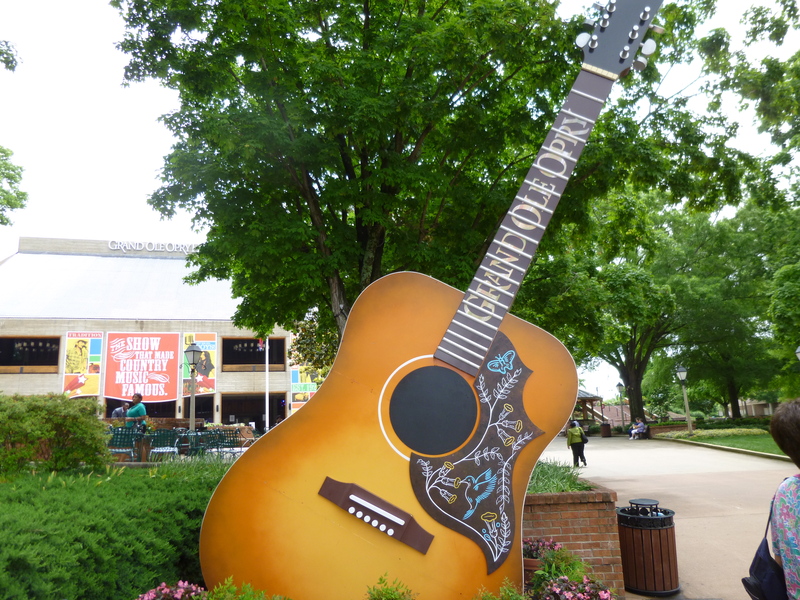 From there we wandered back over by the Grand Old Opry House and I popped into the gift store for a quick look around. 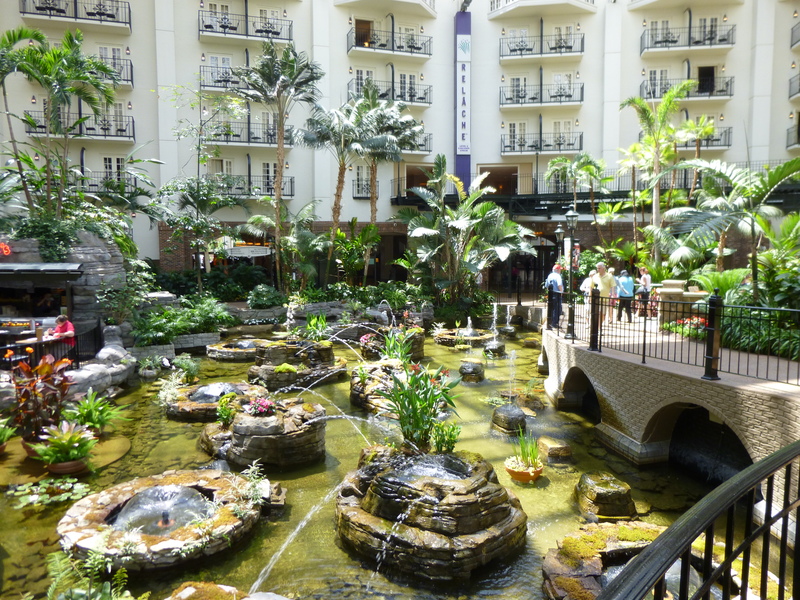 Then we got Tula out for a few minutes, and decided to go see a couple of the conservatories that are part of the Gaylord Opryland Hotel complex. This area reminds me just a little of Las Vegas, since there’s a big glitzy show place right next to a hotel complex that is so big people must get lost in there all the time! The conservatories were spectacular – trees, ferns, flowers, formal gardens and even a big pond with a boat that took people for rides. And yet it was all indoors – kind of hard to believe. I think there are 4 conservatories and we walked around 2 of them. The Meharry Medical School was having their graduation there, which was part of the reason for the crowds – lots of proud and happy new young doctors and their families all dressed up for the special occasion. 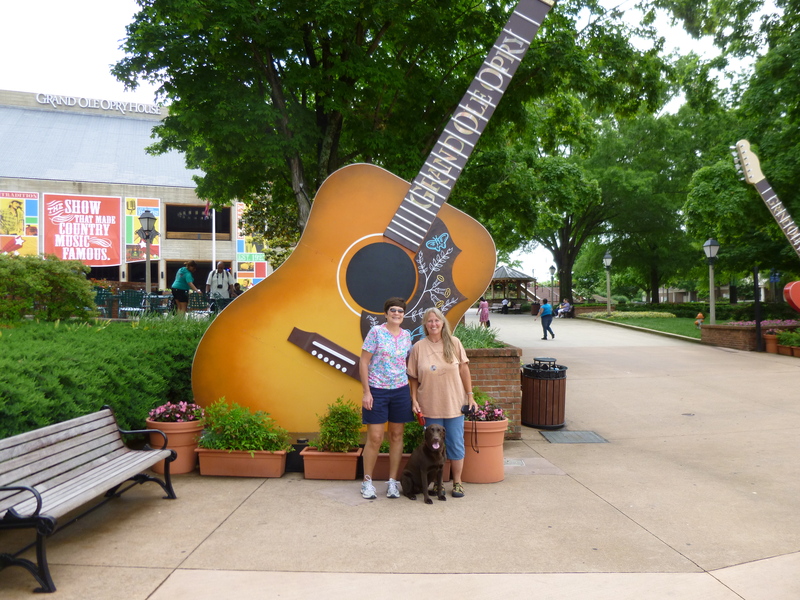 Between the mall, the Grand Old Opry grounds and the conservatories, we walked almost 5 miles. Then it was time to part ways – 2 old school friends had an awesome 4 days together and it will be a very special part of my adventure. 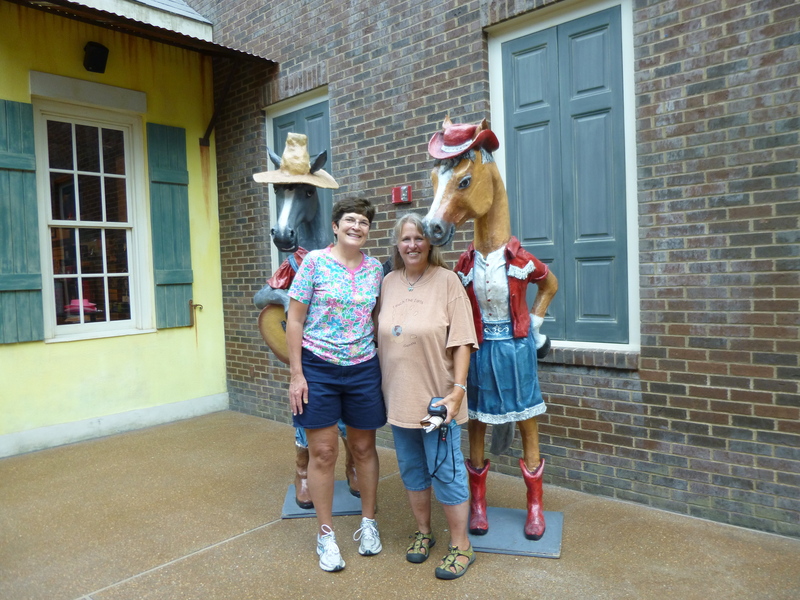 Thanks again for making the Tennessee leg of my journey so wonderful, Linda!! Linda ended up walking nearly 26 miles with me – 9 of them in the rain! I’ve been very spoiled these last couple of weeks, having my sister Christy walk with me in the Virgin Islands, and now Linda walking with me in Tennessee! Then I headed east. 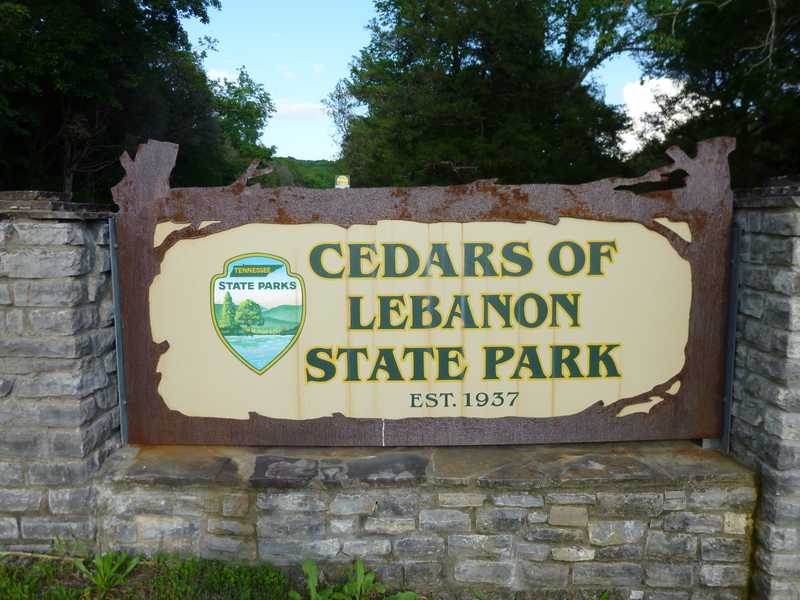 I didn’t get very far when I saw signs for the Cedars of Lebanon State Park, and I decided to stop there for a little outdoor walking. 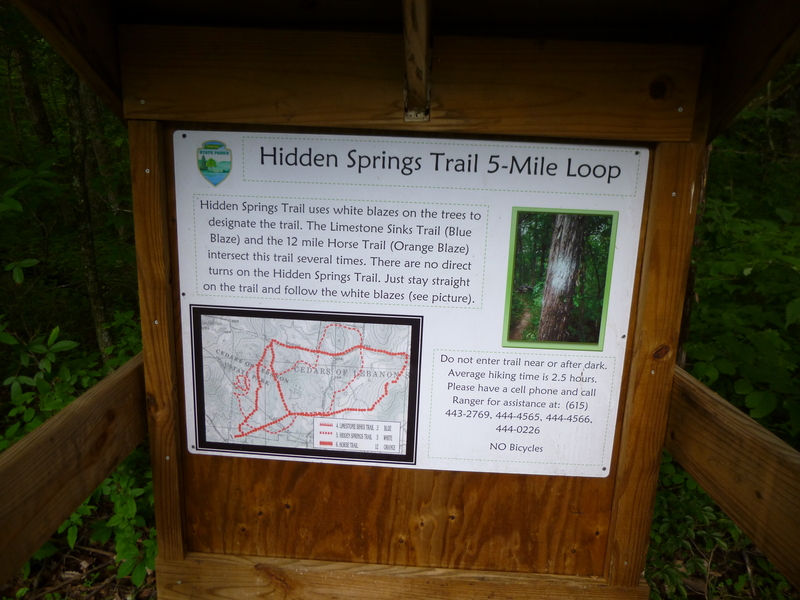 I ended up choosing the 5 mile trail since I had enough time for that. 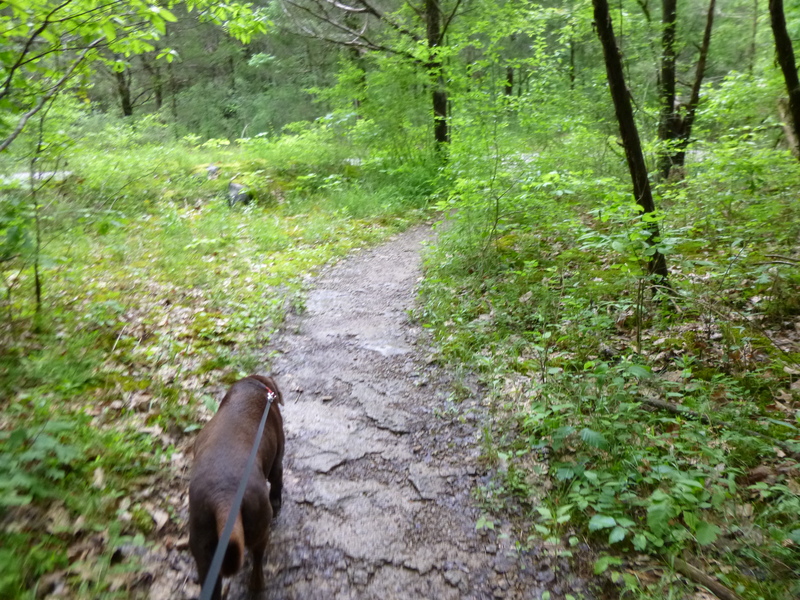 So Tula and I set off – it was a bit muddy from all the recent rain, and although it started out as kind of a wide trail, it soon narrowed down so it was little more than a footpath. 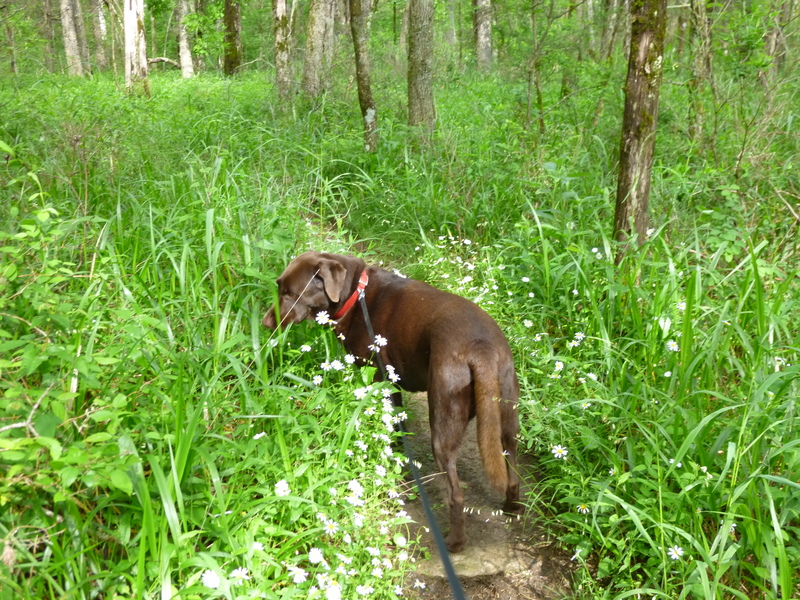 But, mud and all, I decided to continue on – it was a pretty afternoon. We had to detour around quite a few huge puddles, but I could tell some people had been ahead of me. 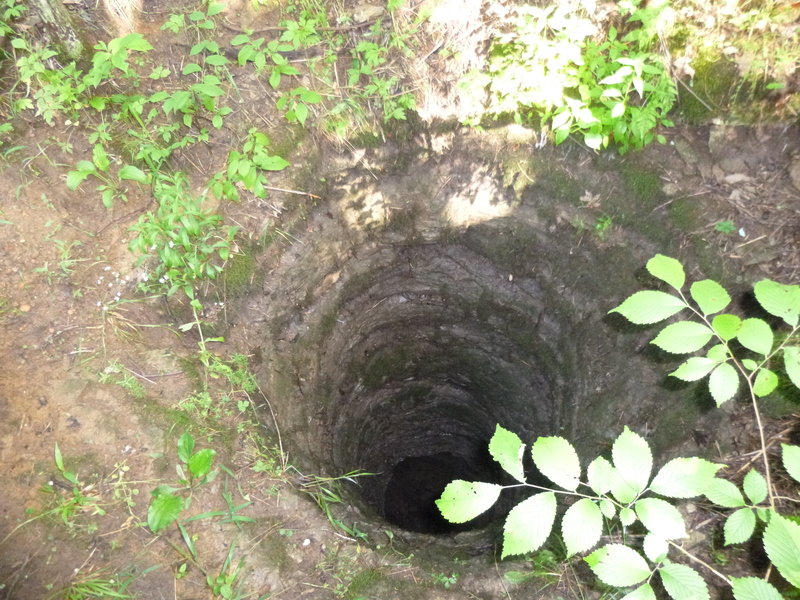 There were lots of sinkholes in the area with little fences around them – they looked like bottomless pits – it’s pretty amazing to look down into them. 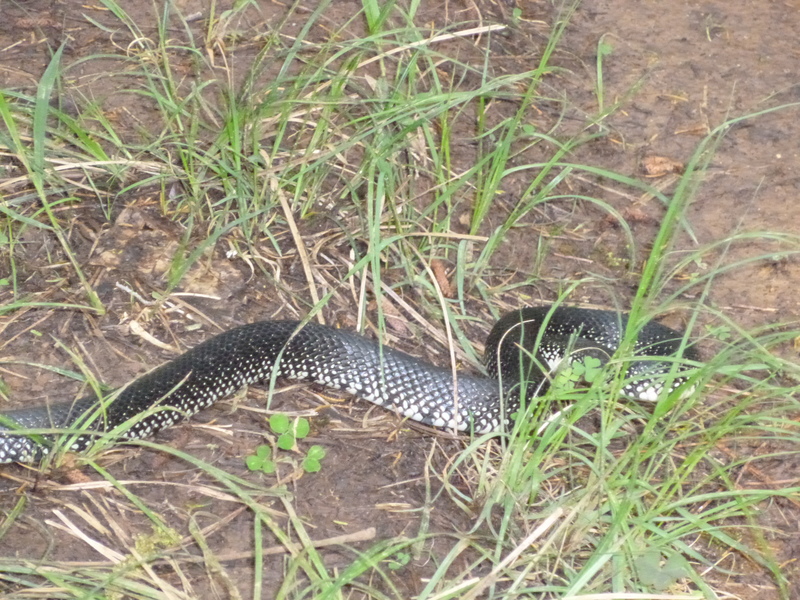 Things were fine up until about 4 miles into the walk, when I nearly stepped on a huge bluish, black snake right by the edge of the path. Tula had already walked by it, so it was now between me and Tula on the leash. I must have screeched or something because Tula turned around and was going to come back, but I didn’t want her walking past the snake again. 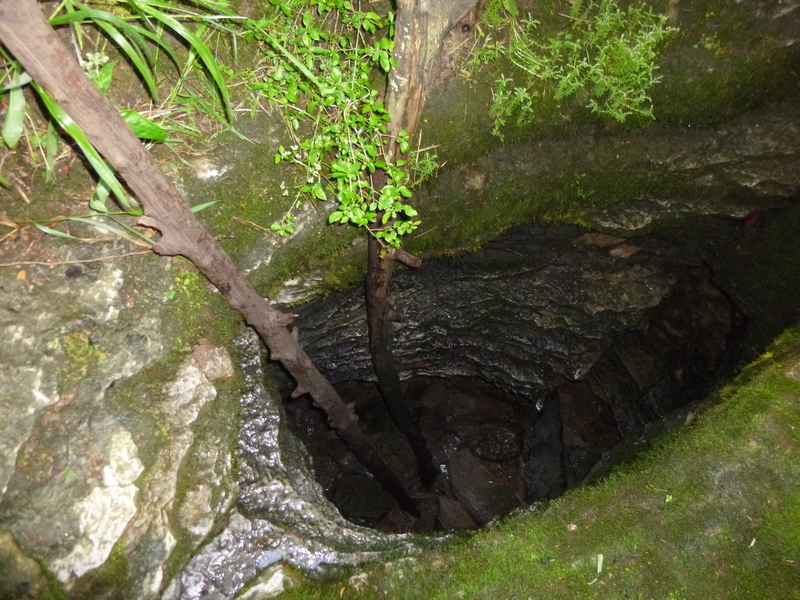 I have no idea what I did to get around it – jumped, circled, ran around it?!? I don’t know, but if someone had had a video camera, I’m sure it would have been funny to watch. But it scared me – it was so long. 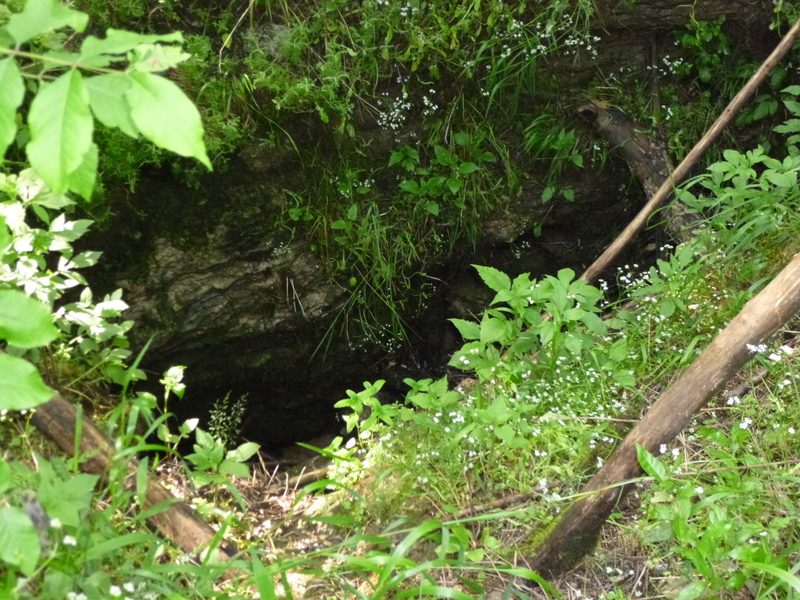 I got to a safe distance so I could get a picture because I wanted a ranger to identify it for me. I was worried about it being a poisonous snake. I worried about snakes until I was back in the parking lot, and I was sure there were others waiting to sneak up on me! I told myself I was never going to walk in the woods again (that didn’t last though!). I think what scares me the most about snakes is being startled by them – some of them move so fast. I know they’re there – I just wish I knew when I could expect to see one, then they wouldn’t scare me so much! I was very, very happy to get back into the car, and felt good about walking almost 10 miles today. I drove to the west side of Knoxville, where I stopped for the night, ready to see the Smokies tomorrow. I didn’t run across any good donation opportunities today – weekends can be a bit more challenging. But I would run across 2 tomorrow, so I’m still on track! In all – I walked nearly a marathon with you Nancy – what fun we had! Tula walked a good bit of those miles too! It was really great having you here and showing you around Nashville. 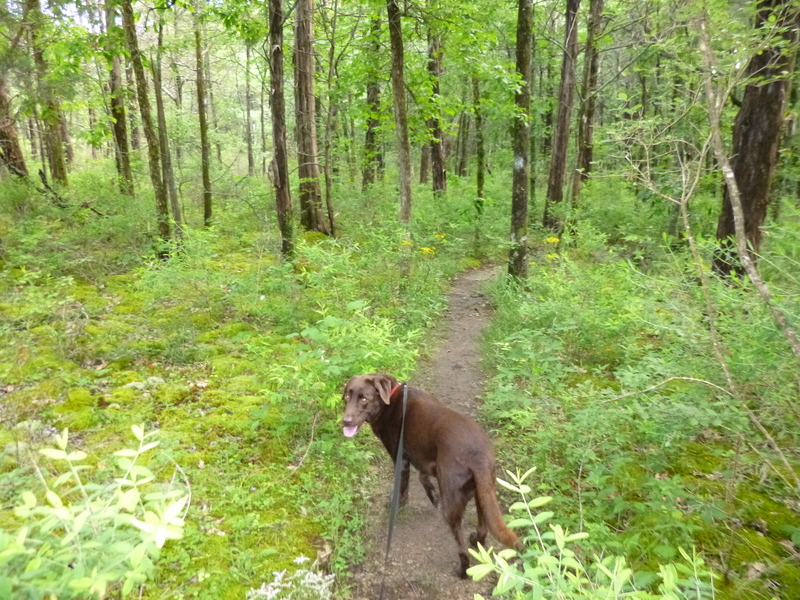 We pray for safe travels for you and Tula as you finish the last 23 states on your expedition! I experienced the snake thing too hiking in WA state. Charlie dog stepped right over the snake, you’d think the darn dog would warn you! Jump! I guess the dogs believe in “live and let live”.